I forgot, I have no recollection, what do you mean? These are answers from the lips of Lying Hillary. Apparently she developed a case of Stupiditis when interviewed by the FBI or on the second hand she is not capable of any discourse involving her tenure as Secretary of State. Whatever it is, there is something wrong here. Did she have a frontal lobotomy? Does Hillary Clinton suffers from some type of malady; we all know that some of it can be attributed to liberalism, the worst disease known to man. When she fell on her head did some cerebral fluid leak from her brain? Agents also asked Clinton about a 2011 cable, first documented by Fox News, that went out under her signature as secretary of state and advised State Department personnel against personal email use because of the high risk of cyber intrusion. Clinton told the FBI she could not recall the specific cable. THE LADY IS NOT ONLY A LIAR, BUT A DAMN LIAR AT THAT! Megacities are becoming the norm; urbanites comprise 60% of the world population. Densities in many cities are such that inhumane conditions are commonplace. Diseases spread in seconds, police are afraid to police, governments are not able nor willing to contain suburban conflicts where the scum invades them with impunity, the law of the jungle prevails. Urban gutters built on hillsides and landfills are becoming ubiquitous; think favelas. City dwellers without jobs live on pennies a day, rule of no law dictates the lives of those who have no future. Effectively these uninhabitable sewer pit swamps will dictate new ways by authorities to contain the human garbage; it won’t be easy as ecosystems are overrun; drug infested areas inhabited by zombies will force government to deal with new ways to contain the contagion. Expect policing policies to seek advanced technical solutions; robotic enforcers will be piloted by those who obtained their experience playing video games. Warfare by remote will be in real time. CLICK HERE FOR THE VIDEO ON WHAT OUR AND YOUR FUTURE HOLDS. CLICK HERE FOR THE STORY. This is an outrage. Not answering legitimate questions by ranking members of Congress manifests the Obama coverup of ransom payments to the greatest sponsor of terrorism, the Shiite regime of Iran. Donald Trump’s challenge to the Washington elite heads to the nations’s capitol. Recent polls suggest that he is on the verge of the greatest upset victory in political history. Not even a one million to one shot a year ago, Trump has defied the long shot odds by dispatching one opponent after another. Hillary Clinton is the last obstacle that stands in his way. Beating her will obviously turn Washington upside down. To think of the RINOs he killed along the way; Bush, Chavez, Kasich, Perry among others. But he also had to tolerate the Republicans who ganged up on him, for instance Romney and Ryan. What Trump has done is to out the RINO, come November 8, the day of reckoning, he will finish the job. This 15 month safari was not a typical sight seeing journey. From the beginning of the hunt he repelled one RINO attack after another and survived. We now find these RINOs lying on the side of the road, dead and long forgotten. What the Tea Party set in motion back in 2009 is now culminating in a violent upheaval of our political system. The Republican party is all but dead. True loving Americans can’t wait for the mass burial to take place on November 8. UK Daily Mail An imam led the group in chants of ‘Allah Akbar’ which means ‘God is great,’ as they kneeled to the ground facing the Colosseum. 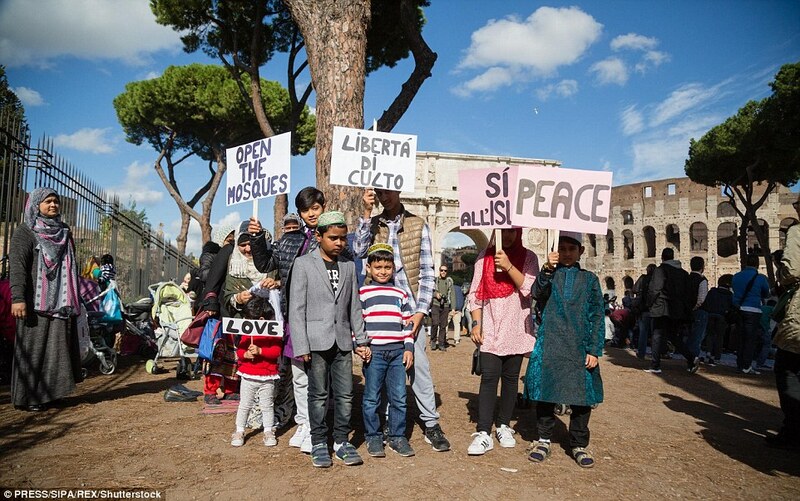 The protest was organized by a Bangladeshi group, Dhuumcatu, which has complained that smaller or more informal mosques in Rome have been branded illegal by authorities for building violations. At least 1.6 million Muslims live in the country but there are only a handful of mosques officially registered with the Italian government. Most worship takes place in houses and Islamic cultural centres. But, Italy’s Interior Minister Angelino Alfano said in August that ‘mini mosques in garages’ should not be allowed as it makes them difficult to monitor, possibly raising the risk of radicalisation. The Dhuumcatu Association, said police had closed three improvised mosques in Rome in last few months. The peaceful protest was criticized by conservative politicians. 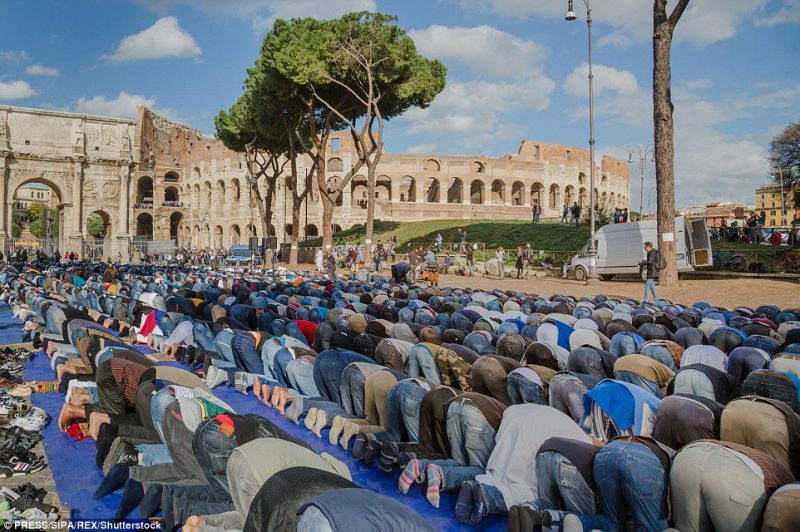 Gian Marco, leader of the anti immigration Northern League, said: Muslims today who decided to pray in front of the Colosseum had to be stopped. It was a scene that was unacceptable’. The Colosseum has great significance in the largely Catholic country. It is generally regarded by Christians as a site of the martyrdom of believers during the Roman Empire’s persecution of the religion. A cross now stands outside the building inscribed with the words: ‘The amphitheater, one consecrated to triumphs, entertainments, and the impious worship of pagan gods, is now dedicated to the sufferings of the martyrs purified from impious superstitions’. 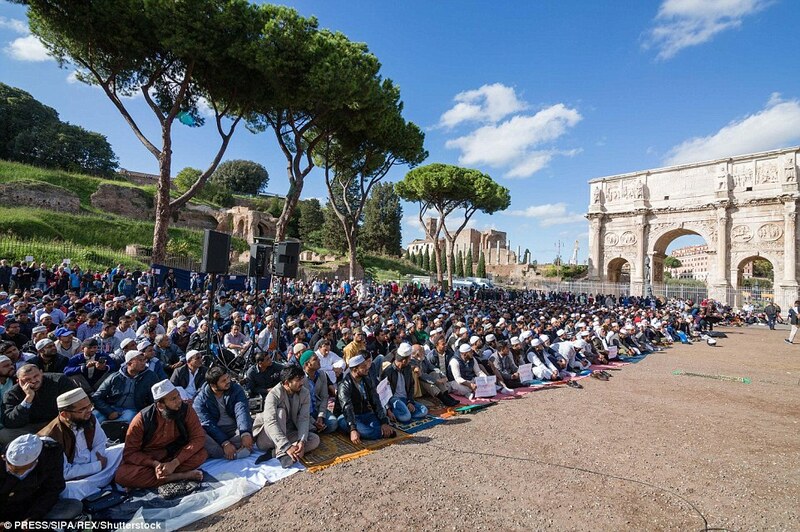 An imam led the group in chants of ‘Allah Akbar’ which means ‘God is great,’ as they kneeled to the ground facing the Colosseum. 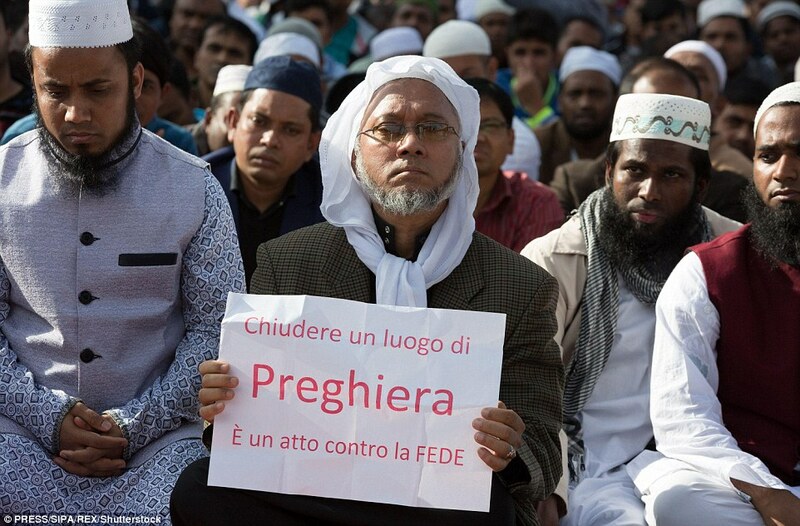 The protest was organized by a Bangladeshi group, Dhuumcatu, which has complained that smaller or more informal mosques in Rome have been branded illegal by authorities for building violations. Muslims know darn well they can pray anywhere. This is clear as the sky on a sunny day. They chose to pray in front of the coliseum because of its significance to the martyrdom of Christians, and not that they are against it, but that they support it. Mark my words, if these people had the opportunity to do what the pagan Romans did to the Christians, they would as soon as it was advantageous to them. You will never have peace with Muslims in society because Islam does not want it. The only peace that you will have is a hudna– a temporary armistice whose sole purpose is to stop the assault against the Muslims so they can reconstitute themselves, only to wage an attack later. There is never any peace in Islam- there is conquest or submission, but no peace. Do not be fooled by these pleas for “religious tolerance.” Islam does not tolerate anything except Islam. It is simply a front to get themselves deeper into Italy with the intentions of making conquest later. This was nothing less than an attempted show of force, and kudos to the Italian government for shutting down the mosques and so far not backing down in the face of Muslim complaints.